CHICAGO - Canon Medical Systems USA plans to highlight an artificial intelligence (AI) protocol for CT data reconstruction, a new premium 1.5-tesla MRI scanner, a high-end vascular imaging system, and a new line of midrange ultrasound systems at its first RSNA show after Canon rebranded Toshiba's medical imaging assets earlier in 2018. Canon completed its purchase of Toshiba's healthcare business in 2016, but it didn't complete its rebranding effort until January. 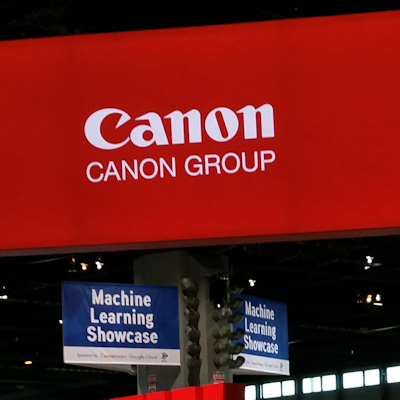 While the logo may have changed, visitors to Canon's booth at RSNA 2018 are seeing many of the same familiar products and services encountered at previous meetings -- as well as some new ones. In addition to big iron product introductions, Canon is launching a new program called Collaborative Imaging, designed to address how the company can work with customers on integrating radiology data with their enterprise IT networks. Key to the program are use cases that show how Canon imaging data can flow through an enterprise network for five areas: stroke, lung, liver, musculoskeletal, and structural heart imaging. For the stroke use case, for example, Canon's Neuro One CT noncontrast brain imaging protocol can perform five studies with less than 5 mSv of radiation dose and have a report on a physician's desk in less than five minutes, which is key in determining how to triage patients and whether to send them for mechanical thrombectomy. Additional functionality is possible through the integration of advanced visualization components from Canon's acquisition of Olea Medical in 2015. 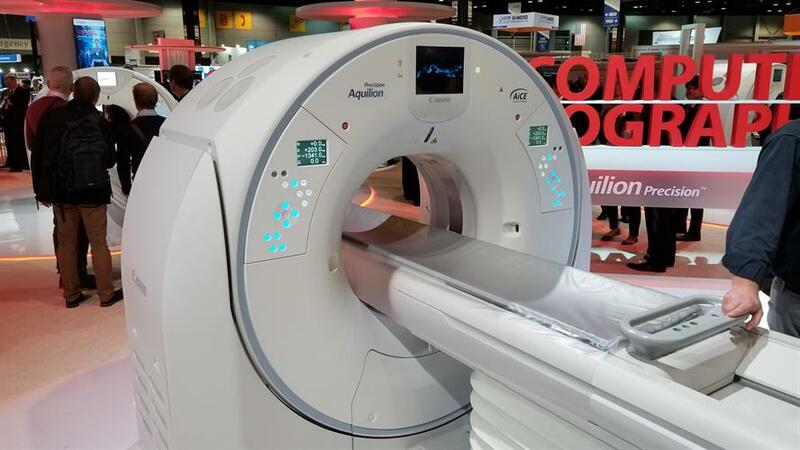 Canon is highlighting three CT gantries in its booth at RSNA 2018: the Aquilion Precision high-resolution scanner, the Aquilion One Genesis with 16 cm of coverage, and the Aquilion Prime SP midtier scanner. 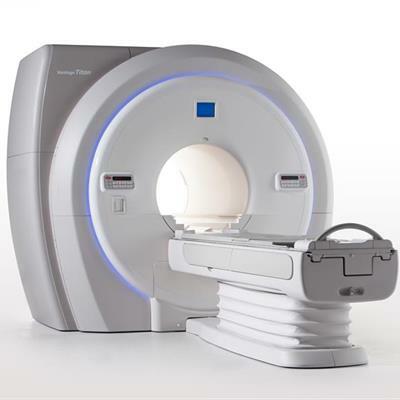 Canon's Aquilion Precision CT scanner. A major emphasis is on clinical pathways for using CT to diagnose common conditions. For example, Canon is discussing how the Genesis scanner with its area detector, stroke protocol, and Vitrea advanced visualization workstation can be used to help direct which stroke patients should be sent on for mechanical thrombectomy, per recent American Heart Association guidelines. Another pathway is structural heart imaging. Aquilion Prime SP and Aquilion One Genesis are excellent choices for planning cardiac procedures using structural imaging, such as aortic valve replacements and mitral valve clipping, according to the company. Artificial intelligence has been a hot topic at RSNA 2018, and Canon is demonstrating a new data reconstruction technique that puts AI to work to reduce radiation dose dramatically, called Advanced Intelligent Clear-IQ Engine (AiCE). Canon trained the AiCE algorithm to take low-quality low-dose images and produce high-quality images that are comparable to images reconstructed with the vendor's forward projected model-based iterative reconstruction solution (FIRST). AiCE works so well that it can be used with the Precision scanner to create high-resolution scans with the same radiation dose as conventional scans; the technique can reconstruct up to 40 images per second thanks to Nvidia graphics processing unit (GPU) boards that Canon recently incorporated into its scanners. Canon has applied for regulatory clearance for the technique. Canon is also highlighting the recent receipt of 510(k) clearance for Vantage Orian, a new premium wide-bore, 1.5-tesla scanner that the company first introduced at the 2018 European Congress of Radiology (ECR) in March. The Vantage Orian MRI scanner. To develop Orian, Canon completely redesigned its MRI digital architecture by moving the electronics in the scanner gantry, enabling the use of an independent analog-to-digital converter (ADC) for each of the system's 128 channels. Orian also features a dockable, removable table, while supporting the same Pianissimo noise reduction technology and MR Theatre patient entertainment system found on other Canon magnets. Canon has begun taking orders for Vantage Orian and plans to begin the first U.S. shipments in February. Alphenix is a new interventional angiography platform that Canon is launching at this week's meeting. The system will occupy a higher price point than the company's Infinix-i unit, which will remain in Canon's product catalog. Alphenix sports three major enhancements over the Infinix platform. First, the new platform features 16-bit digital throughout the entire imaging chain thanks to a new processor. Sixteen-bit imaging enables a number of new enhancements, such as Illuvis, a noise reduction protocol that cleans up noise in images. The technique is particularly useful for cardiac images. Other Alphenix features include a conebeam CT mode called AlphaCT for low-contrast imaging, and a real-time autopixel shift mode that will clean up images in less than 10 msec, leaving them with less ghosting and artifacts. Alphenix also features a new high-definition flat-panel digital detector. The detector is basically two panels in one, enabling users to switch to high-definition imaging with the push of a button. Users can achieve resolutions of 3 x 3 cm, 2 x 2 cm, and 1.5 x 1.5 cm to visualize very fine details. The detector is available on the Alphenix Core Plus 12 x 12-inch panel and biplane panel. The third major component of the new Alphenix platform is a workstation that combines technology from the Infinix workstation with advanced applications from the Vitrea workstation developed by Canon subsidiary Vital Images. This eliminates the need for two separate workstations to run routine and advanced applications, according to the company. Finally, Alphenix features a table that enables users to manipulate the system on the go rather than being tied to a workstation. Users can position the system at different angles with the touch of a button, according to Canon. An Alphenix system has been running at Gates Vascular Institute in Buffalo, NY, with the first commercial installation scheduled for January 2019. Twelve Alphenix systems are currently installed in Japan. 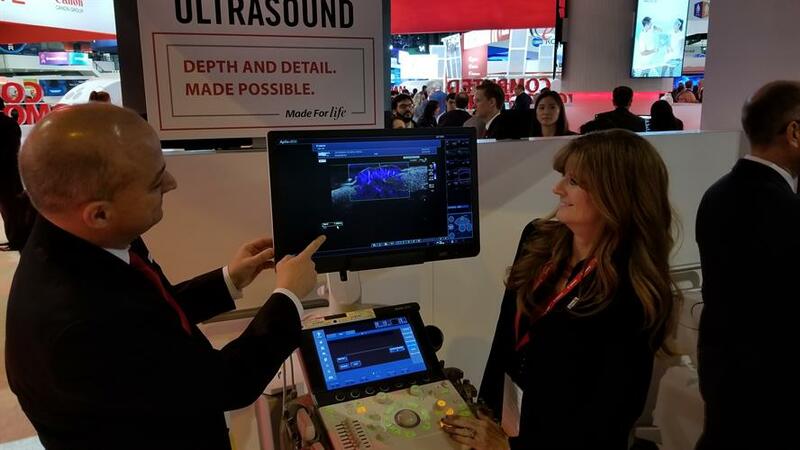 A new family of midrange ultrasound scanners called the A-series is a highlight in the ultrasound section of Canon's booth. The company is also showing updates for its premium Aplio i-series of scanners. The A-series scanners offer the same ergonomics and workflow as the i-series, but at a midrange price point. The main scanner to be sold in the U.S. is A550, while A450 will be sold primarily in Europe. Both scanners recently received 510(k) clearance in the U.S. and will begin shipping after RSNA 2018. The Xario line is also getting a new addition, Xario G, which is available in two configurations: Xario 200G and Xario 100G. The new models are designed for enhanced portability and mobile use without a connection to a wall outlet: 100G can scan for four hours on a single charge, while 200G can operate for eight hours. Another important feature on the Xario G scanners is a two-second bootup time, which is important for mobile operation. The systems have received regulatory clearance and will begin shipping in early 2019. For the premium Aplio i-series scanners, Canon is launching a new version 3.1 software release. The release includes Windows 10 and a number of cybersecurity enhancements. Customers in Canon's installed base will receive the 3.1 upgrade under the company's Reliance program. New advanced clinical applications being launched for the Aplio i-series line include multiparametric report, a liver assessment package that combines multiple imaging modalities such as shear-wave elastography into single report, along with lab results, biochemical findings, and pathology. Another advanced application, contrast ultrasound, will have new features for the i-series scanners. These include contrast vector imaging (CVI), which shows movement of contrast bubbles graphically and provides a velocity measurement to better assess blood flow. Finally, four new probes are being introduced for the Aplio i-series scanners, including a 33-MHz linear-array transducer for skin-level imaging. The probe sports 50-micron resolution at 33 MHz, which is better than the resolution possible with MR, according to the company. The other three new probes are for women's imaging and ob/gyn use. Canon ultrasound image acquired with 33-MHz transducer. The big news in the x-ray section of Canon's booth is a new console for the Ultimax-i multipurpose radiography/fluoroscopy system. Ultimax-i is able to perform three main types of studies -- radiography, fluoroscopy, and routine angiography -- but two separate consoles were used for the radiography and dynamic studies. The new console incorporates both static and dynamic x-ray studies, making workflow more efficient and saving costs for users. 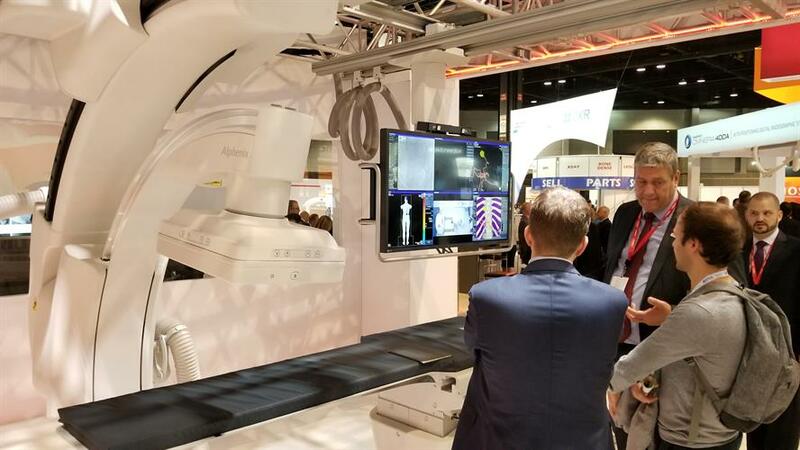 The single integrated console is being shown at RSNA 2018 for the first time. Canon is also highlighting a new mode that helps improve the quality of radiography images acquired with Ultimax-i. Ultimax-i is available with or without an overhead tube crane, but sites that use the system mostly for fluoroscopy sometimes do not purchase it with the tube crane. The new mode enables these users to produce high-quality radiography studies without the overhead tube crane. On the software side, Canon is showing an autocentering mode for Ultimax-i that centers images on the screen no matter how patient anatomy was positioned on the x-ray detector. The mode can be useful for reject analysis, DICOM reporting, and sending images. Finally, Canon is showing products from Virtual Imaging, the Canon subsidiary that makes classic radiography systems. On display is RadPro Omnera, a ceiling-mounted system, and RadPro Mobile 40kW Flex Plus, a portable unit. New for the systems is an IntelliTouch feature that enables users to touch and enlarge images on the display screen. 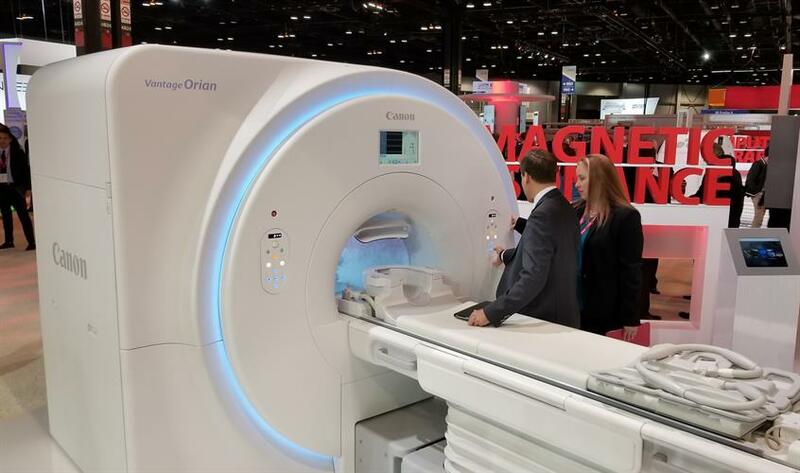 Canon Medical Systems USA has received 510(k) clearance from the U.S. Food and Drug Administration (FDA) for its new Vantage Orian 1.5-tesla MRI scanner. Canon Medical Systems USA has launched a program designed to reduce the causes of pain and injury for sonographers at work so they can scan more comfortably. Canon installs 1st MR Theater in U.S.
Canon Medical Systems USA has delivered its first Vantage Titan Zen Edition 1.5-tesla MR Theater in the U.S.